// Global access point to Logger singleton. // Write some information to the log. // ensure Singleton pattern usage). // Contained Logger singleton instance. // . . . other resources that are held by the singleton . . .
// Initialize the instance pointer. // Global access point to the statistics singleton. // Record a timing data point. // Report recorded statistics to the log. log ("Avg timing %d: "
// Internal accessor for an average. // Contained Stats singleton instance. // . . . other resources that are held by the instance . . .
// Logger, Stats singletons do not yet exist. // Logger and Stats singletons created  during the first iteration. // do some work between timestamps . . .
// then record the stats . . .
// . . . and log some output. // Logger and Stats singletons are not cleaned up when main returns. T *t_; // Holds the singleton instance. // destroyed when the destructor of logger_destroyer is run. // By default, simply deletes this. // Global access point to the	wrapped singleton. // Details of Double Checked  Locking Optimization omitted . . .
// Manager to control destruction. // Instance of the singleton adapter. // . . . other methods omitted. // ENOMEM), or 1 if it had already been called. // calls, or 1 if it had already been called. // single-threaded when this flag returns 1. // dynamically allocated by the library. // This enum value must be last! // Unique identifiers for Preallocated Objects. // Accessor to singleton instance. // Don't delete this again in fini. 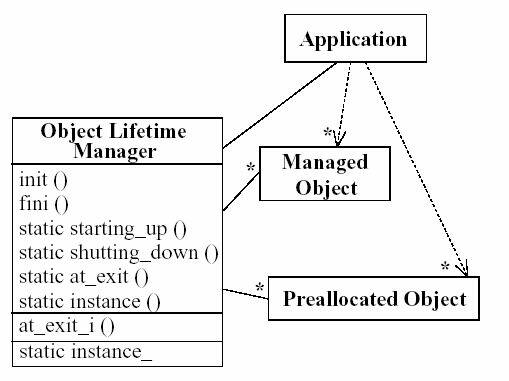 // Array of Preallocated Objects. // in the process. So, it's not thread safe. // the default constructor. Verify that . . .
// Recursive mutex initialization omitted. // Other startup code omitted. // instance is being shut down. // registered for termination, do it. // Protect against recursive calls. // the singleton Instance is being destroyed. // Mutex destroy not shown . . .
// Recursive mutex destroy not shown . . .
// instance has been shut down. 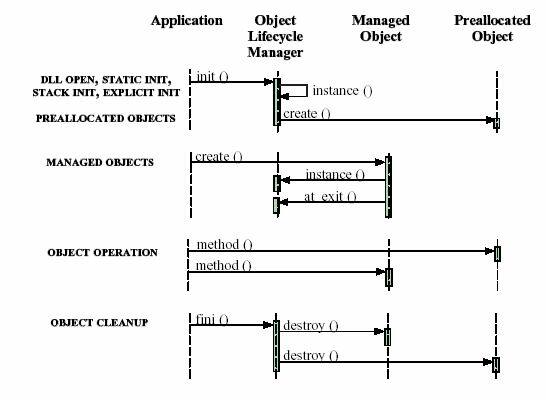 // The object is an ACE_Cleanup.